1. 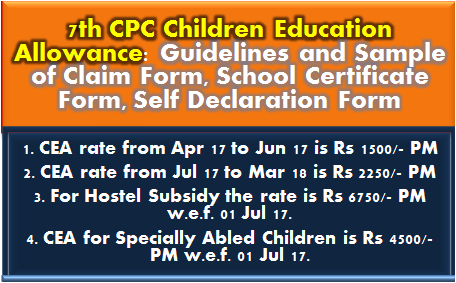 CEA rate from Apr 17 to Jun 17 is Rs 1500/- PM (required to submit School fees receipt and bills). 2. 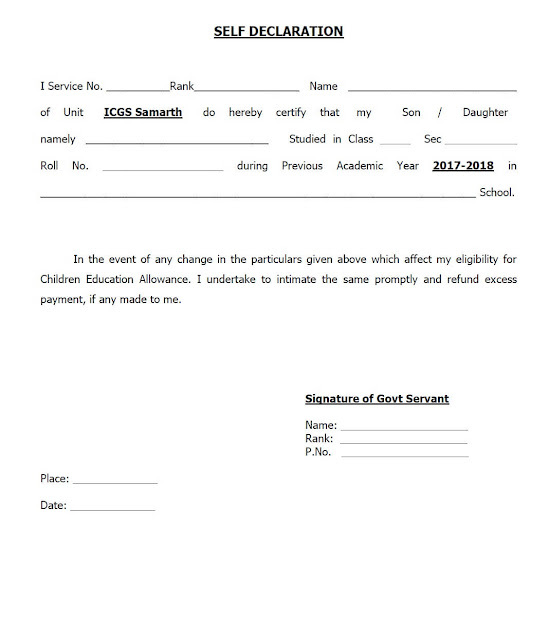 CEA rate from Jul 17 to Mar 18 is Rs 2250/- PM (Fixed amount no need to submit receipts / bills). Jul 17 to Mar 17 @ 2250/- PM 20,250.00 Fixed amount. 15. If Yes at Item No. 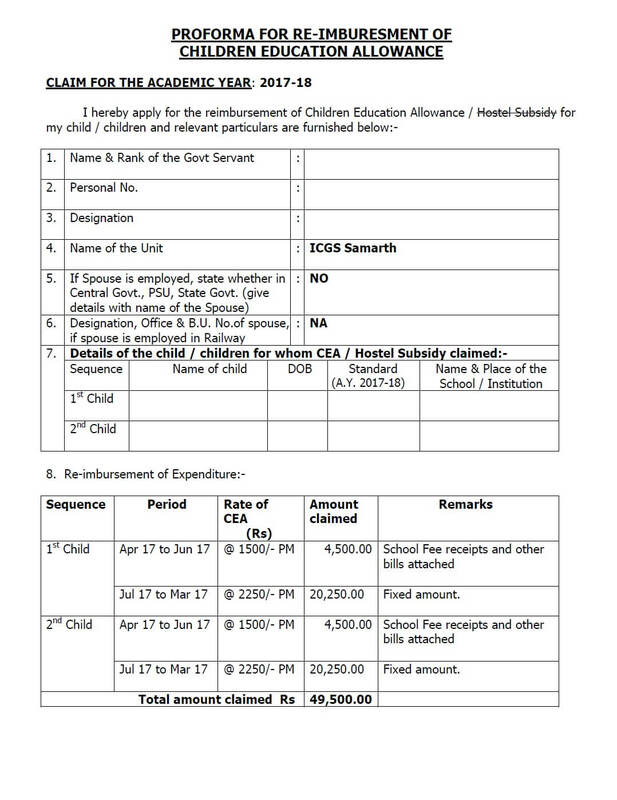 14, Amount claimed for Hostel Subsidy: Rs NA . 16. 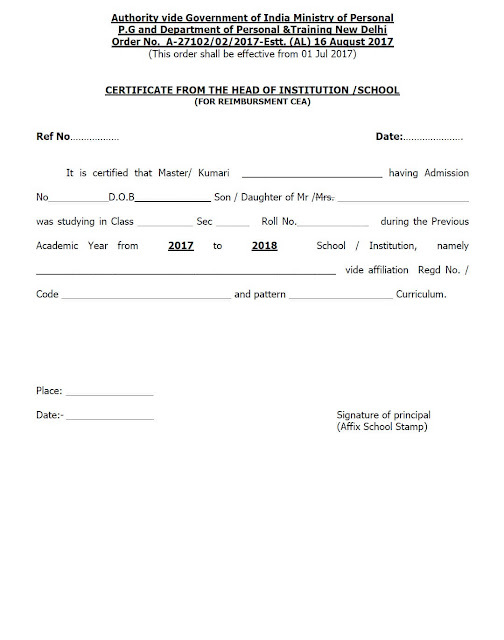 (a) Certified that I or my wife / husband is / is not a Central Government servant. 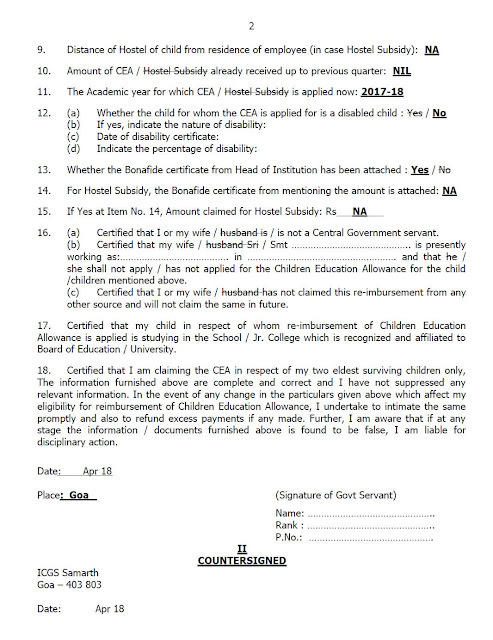 she shall not apply / has not applied for the Children Education Allowance for the child / children mentioned above. (c) Certified that I or my wife / husband-has not claimed this re-imbursement from any other source and will not claim the same in future. 17. 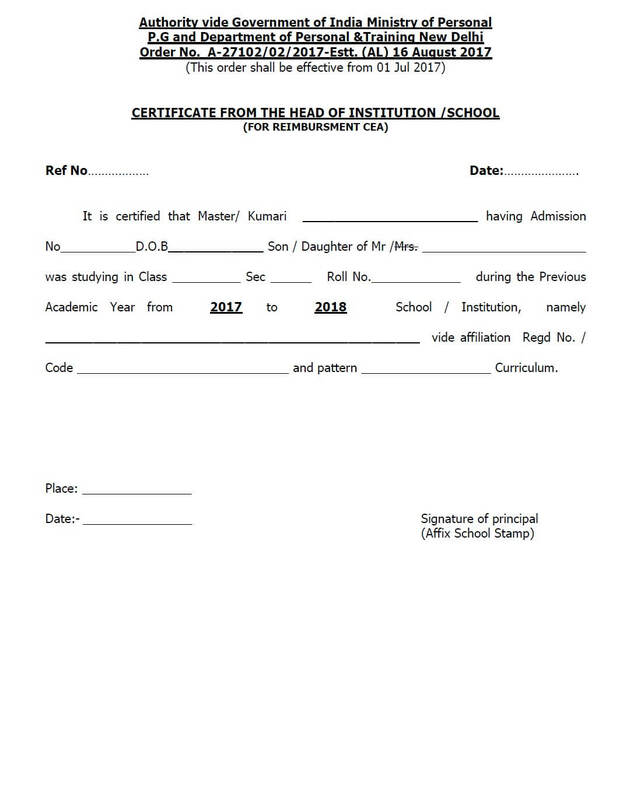 Certified that my child in respect of whom re-imbursement of Children Education Allowance is applied is studying in the School / Jr. College which is recognized and affiliated to Board of Education / University. 18. Certified that I am claiming the CEA in respect of my two eldest surviving children only, The information furnished above are complete and correct and I have not suppressed any relevant information. 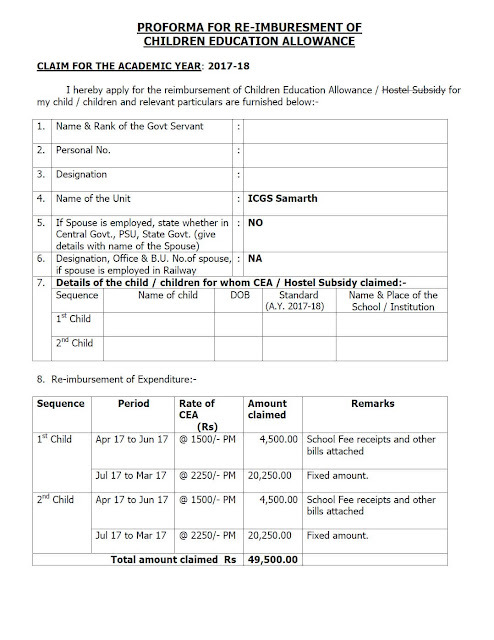 In the event of any change in the particulars given above which affect my eligibility for reimbursement of Children Education Allowance, I undertake to intimate the same promptly and also to refund excess payments if any made. Further, I am aware that if at any stage the information / documents furnished above is found to be false, I am liable for disciplinary action. Code ______________________________ and pattern ____________________ Curriculum. 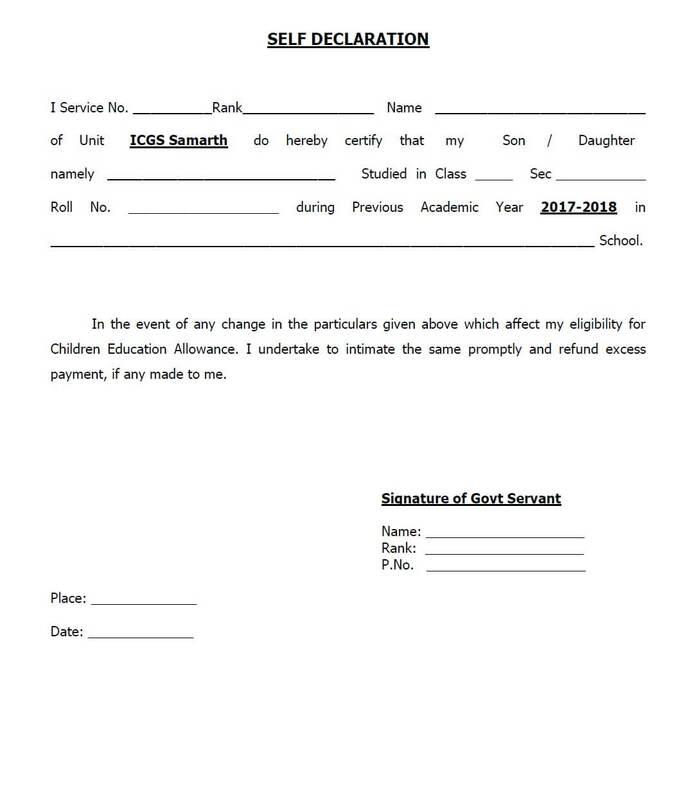 of Unit ICGS Samarth do hereby certify that my Son / Daughter namely_________________________________ Studied in Class ________ Sec _______________ Roll No.__________________ during Previous Academic Year 2017-2018 in __________________________________________________________________________School.